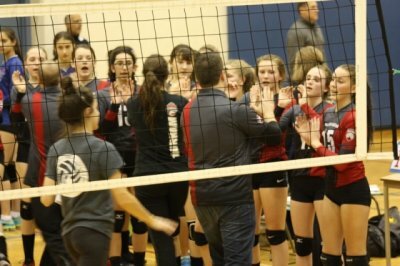 Durham Attack Girls 14U Black Energy took to the court on February 25th in the 14U Bugarski Cup, Premier Division. Playing with confidence and composure and demonstrating exceptional technical skills the team defeated Barrie Elites (13U). Energy entered the tournament ranked third and faced a familiar rival next, the fourth ranked Storm Monsoon. DA again displayed excellent team work and talent, but came up just short ending the round robin portion of the tournament second in their pool. In the infamously important first cross-over game, a win over Storm Twister sent Energy into the semi-finals and the girl’s looked determined as they warmed up to play first ranked Scarborough Titans Synergy. Durham Attack took the court ready to play, and despite the vigour and drive they exhibited, the Titans came out on top in two competitive sets. Durham Attack put up a good fight in the bronze medal game against Markham Revolution Merge, showing true character and sportsmanship, but struggled to find their groove, finishing fourth among an elite group of teams. The DA 14U Girls Energy have developed tremendously on the court conquering new systems and learning different positions. With the dedication of the players, coaches and parents of this team, greatness is just a tournament away! 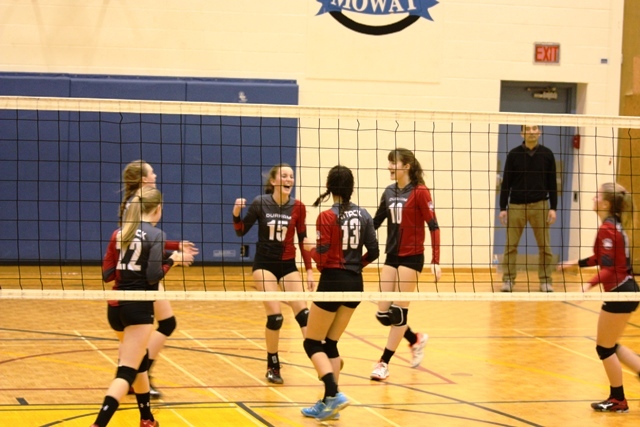 Durham Attack Rage Poised to Win Medal at Final 14U Tournament of the Season!!! !